Dr. Cynthia Tao is a Bay Area native and graduate of the University of Illinois: College of Veterinary Medicine. Prior to that, she worked as a (human) ER nurse in Chicago. Her special interests include shelter medicine and surgery. Dr. Tao has received advanced training in the TPLO surgical knee repair, as well as patella luxation and fracture repair. Dr. Tao is the proud owner of two rescued mutts (Hailey and Sunny), as well as two cats, a Bengal and Brown Tabby (Autumn & Captain Meep). In her free time she enjoys running, being outdoors with her dogs, crafts, piano, field hockey, snowboarding, and paint-balling. Dr. Sooah Goo is a Los Angeles native, graduating from Western University's College of Veterinary Medicine in 2015. She then did a 1 year internship at the VCA West Los Angeles Specialty Animal Hospital before moving to the bay area. 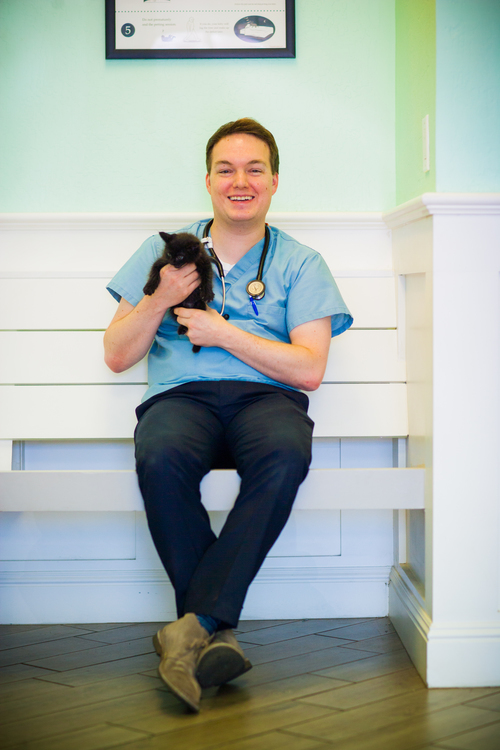 Prior to joining Warm Springs Pet Hospital, Dr. Goo worked as an ER Veterinarian for Iron Horse VetCare in Dublin, CA. She currently lives in Oakland with her husband Brian. In her free time, she enjoys painting (mainly with watercolors), cooking, gardening, paddle boarding, playing with her dogs (Mr. Darcy, Ellie, and Penny) and wine tasting. Dr. Nina Matsuo is a bay area native and 2015 graduate of Ross University, School of Veterinary Medicine. Before moving back to the area, she did a 1 year internship at Carolina Veterinary Specialists, and then worked as an ER and Critical Care doctor for Crossroads Animal Emergency, then the Veterinary Medical and Surgical Group in Los Angeles, California. Dr. Matsuo is fluent in English and Japanese. Dr. Mark Doty grew up in a small town in southwest Ohio before attending The Ohio State University College of Veterinary Medicine. After graduation, he practiced at a 9 doctor hospital in Cincinnati for 3 years, getting exposure to both general practice and emergency medicine. In 2012, he and his wife moved to San Francisco, where he practiced in Pacifica for a year, before joining San Jose Animal Hospital in 2013 and Warm Springs Pet Hospital in 2016. His special interest is in orthopedic surgery. Dr. Doty has received extensive advanced training in ACL knee repair (TPLO, CBLO, TTA-2, IsoLock CrCL, and lateral fabellar suture) as well as patellar luxation repair. Dr. Doty lives in Burlingame with his wife (Ming), daughter (Penny), and 2 dogs and 2 cats.